Pushkar Fair is the largest camel fair in the world. It is celebrated every year in the holy place Pushkar. The town is held in high esteem by Hindus. It houses around 400 temples and 52 bathing ghats. A dip in the sacred waters of Pushkar Lake, especially in the month of Kartik is considered holy. It is believed that it has the curative power to wash away one's sins. Pushkar town is the only blessed place in the world which has a temple dedicated to Lord Brahma, the creator of Srishti (creation). Pushkar fair is held on the day Kartik Purnima (night of full moon) and the celebration continues for the next five days. During the fair the town comes alive with the colours of several cultural activities. 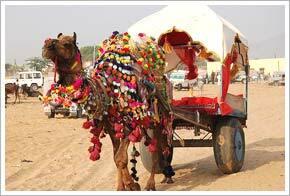 Tourists from far and wide flock to Pushkar to participate in this wonderful fair. Traders participate in the fair to strike good cattle deals. This fair is famous for its well bred camels. Traders not only buy the cattle but also sell. The cattle are groomed well before they are brought to the fair as it is a matter of pride for their owners. Several competitions are held during Pushkar fair, but the most interesting seems to the camel races. Well decorated camels running to win the first prize is a sight to behold. Scan the fair for beautiful bead necklaces, funky silver jewellery not only for you but for the cattle too, woollen blankets, tie and dye textiles, brassware, ropes and other household items. Come and enjoy funny puppet shows, folk dance and music performances and entertaining competitions!